Walking is a terrestrial locomotion in which at least one leg is always in contact with the ground. The speed of walking is limited by the lack of an aerial or leaping phase in which the animal propels itself through the air. To increase their speed, animals must change their gait from walking to running. Running is locomotion with an aerial phase in which the body is lifted from the ground in order to extend the length of a stride. Gait is a regularly repeating sequence and style of limb movements used in walking and running. The gait of two-legged or ‘bipedal’ runners and walkers is simple, while four-legged or ‘quadrupedal’ mammals have more complex and varied gaits which are classified into five types: walking (lateral sequence walk, diagonal walk), trotting, pacing; cantering (rotatory canter, diagonal canter), galloping (rotatory canter, traverse canter),half bound, and bound (ref.5, ref.6, ref.7, ref.8). Fig.10 Gaits of quadrupedal mammals. Filled and open circles show feet in contact with the ground and in the air, respectively. Speed is a crucial aspect of locomotion in most mammals. An ability to move faster may increase success in hunting or escaping. Running speed is controlled by two components of the stride - length (the distance travelled in a single step cycle) and frequency (the rate at which one step follows another). 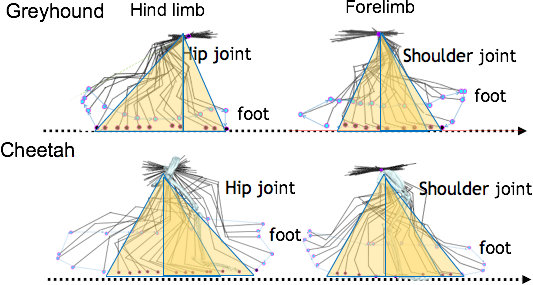 Both stride length and stride frequency are related to body size, with large animals tending to take fewer, longer strides than small species. These differences compensate for one another to some extent, but because stride length increases with increasing body size more rapidly than stride frequency decreases, larger animals generally run faster than small ones, with some notable exceptions. Some of the swiftest-running animals, including the cheetah, pronghorn antelope and several species of hare achieve stride lengths well beyond what might be expected from body size alone, by hurling themselves into the aerial phase of galloping and greatly increasing the distance travelled in each cycle (ref.6, ref.9). 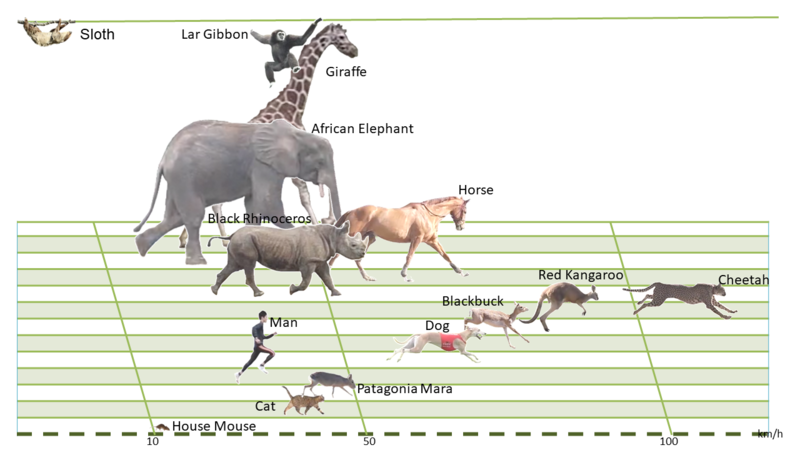 Fig.11 In a simple sprint contest between terrestrial mammals, over flat ground, the cheetah is the runaway winner, followed by the kangaroo antelope. Humans are among the most accomplished bipedal runners, capable of moderate speed and great endurance. Terrestrial mammals can be classified into cursorial and non-cursorial types. Cursorial mammals are runners, anatomically and physiologically adapted to covering long-distances at relatively high speed. This has very important implications for species ecology, as cursorial mammals are able to forage over large areas, exploit distant sources of food and water, take advantage of seasonal variations in food resources, chase down prey or escape from predators and enemies. Typical cursorial animals include horses, cheetahs and wolves. (ref.8). At top speeds a cheetah is capable of moving at more than 29 metres per second – that’s equivalent to 104 kmph or 64 miles per hour (ref.10), making it easily the fastest sprinter on Earth. This extraordinary athleticism is the result of a slender, lightweight body long limbs and an extremely flexible spine that enhance stride length and a long tail that acts as a stabilizer. However cheetahs can only travel this fast for short periods, and only over the relatively flat, even terrain of grassland and savanna, where there are few obstructions. A further remarkable characteristic of the cheetah’s run is the stability of the head – vital in maintaining visual focus on fleeing prey (Fig.12-1). This stability is accomplished by the pendulum-like movements of fore- and hind legs, which act to balance the overall motion, minimizing vertical movement while driving the body forward (Fig.12-2). Fig. 12-1 Note the stable position of the head throughout the step cycle, allowing the cat to maintain visual contact with its prey. This contrasts with the sprinting style of a dog, in which vertical movements of the head are used to maximize forward momentum. Fig. 12-2 Full motion range of fore and hind limbs in a springing greyhound and a cheetah. Cheetahs run using large, matching, pendulum-like movements of both front and hind limbs, flexing the spine to maximize stride length. <Topics> Cheetahs also control air resistance or drag by changing the position of the head and tail. We made seven 1/11 models of the cheetah with head and tail tip at different positions. The hydrodynamic force (F) and drag coefficient (Cd) of these models were calculated using the wind tunnel. The air drag was changed by position of head and tail. Our studies indicate that the cheetah control the air drag to inhibit energy consumption and maintain the body balance at changing the running direction and breaking. The reduction of the air drag by lowering the head position. The decreasing the fluid separation by lowering head position of head indicate the reduction of air drag (①②). We have also proofed that the changing the position of tail changethe air drag remarkably. The giraffe is one of the most instantly recognizable mammals, with its long neck and legs, trapezoid body, knobbly knees and strange, angular head. In overall form it resembles a lifting crane, and there are similar mechanical issues to overcome. In a crane, the weight of the lifting arm is balanced by a counterweight - but a crane doesn’t run. A giraffe has no counterweight and so the considerable mass of the head creates a strong rolling force or ‘mechanical moment’. 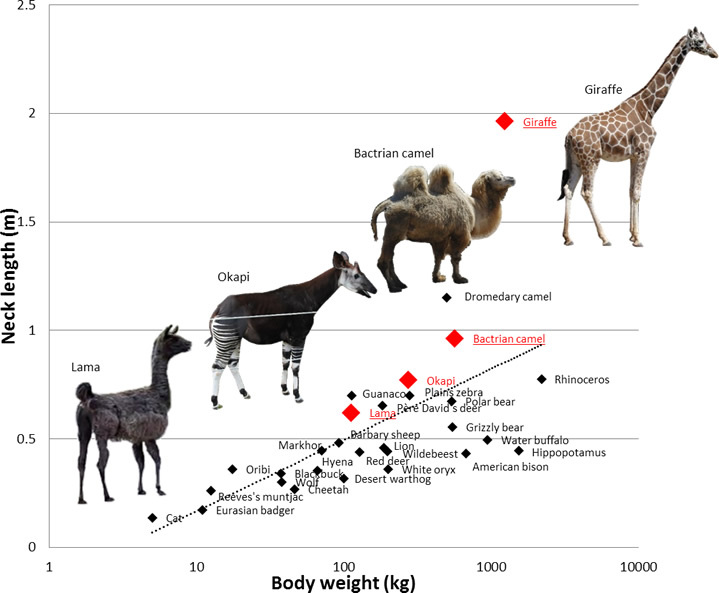 And yet the giraffe maintains balance, even when sprinting through its open woodland and grassland habitat. A giraffe runs using a rotatory canter or galloping gait, with large and dynamic movements of the limbs and the body axis. The shoulder acts as a fulcrum or balance point during running and by raising and lowering its massive neck the giraffe is able to maintain balance both and head position. Fig. 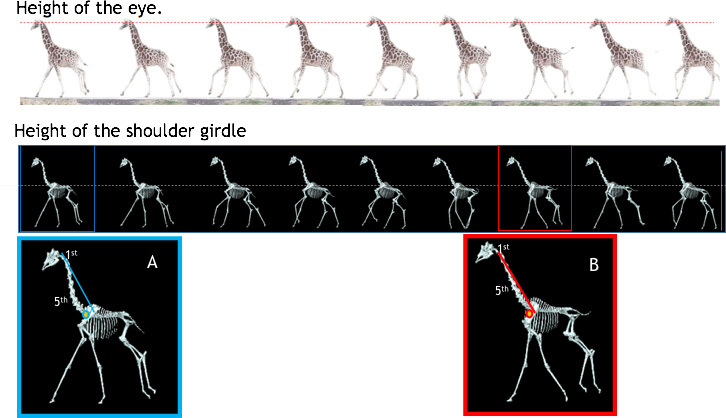 13 A galloping giraffe maintains its head at a steady height during running, compensating for the motion of the body with subtle changes in neck posture. The shoulders are also very stable, allowing the animal to maintain balance despite its top-heavy build. Wolves are the ancestors of the domestic dogs that have become Man’s best friend. The grey wolf is the biggest of the wild canids, and its natural habit is coniferous forest. Its survival and success as a predator is mainly dependent on its intelligence and social organization into structured family groups or packs, but its ability of to perform continuous high-speed running is also crucial. An adult grey wolf can sprint faster than 60kmph (37mph) and can sustain a steadier pace of about a 30kmph (18 mph) run for seven hours. This unrivalled stamina is an invaluable component of wolf hunting strategy – a pack can pursue much larger prey to the point of exhaustion, when it becomes relatively easy to catch and kill. This superb running ability has been passed on to some breeds of domestic dog, which also show clear similarities in running style, using fully extended limbs and see-saw movements of the spine. 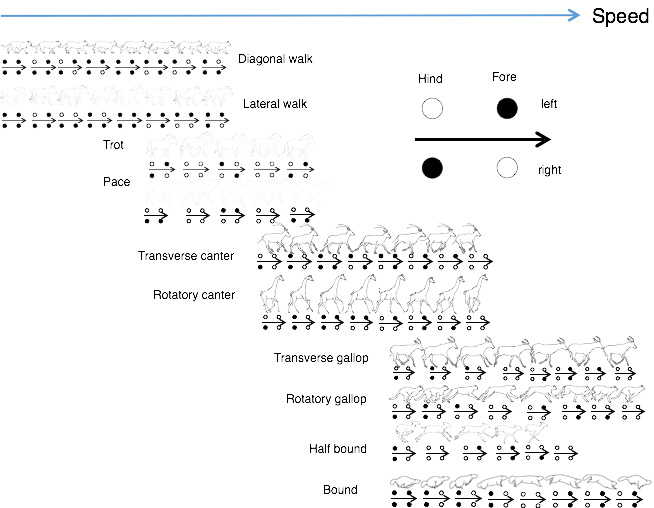 Movements of the head help shift the center of gravity back and forward with each stride, maximizing the force driving the animal forward (ref.11,ref.12, ref.13). While monkeys are often thought of as tree-climbing specialists, many species including baboons and the russet-furred Patas monkey are highly adapted to life on the ground. The Patas monkey is one of the fastest-running primates, achieving at speeds up to 55km/h (34m/h). Its long legs, short digits and slim body are typical characteristics of cursorial animals. Patas monkeys run with a pronounced see-saw motion of the spine, produced by vertical movements of the head and forelimbs. This bounding running gait transitions easily into jumping, with upward movement of the head and forequarters (ref.8, ref.9, ref.12, ref.13,ref.14). Continuous picture of running(A), and jumping(B,,C) of Patas monkey. Fig. 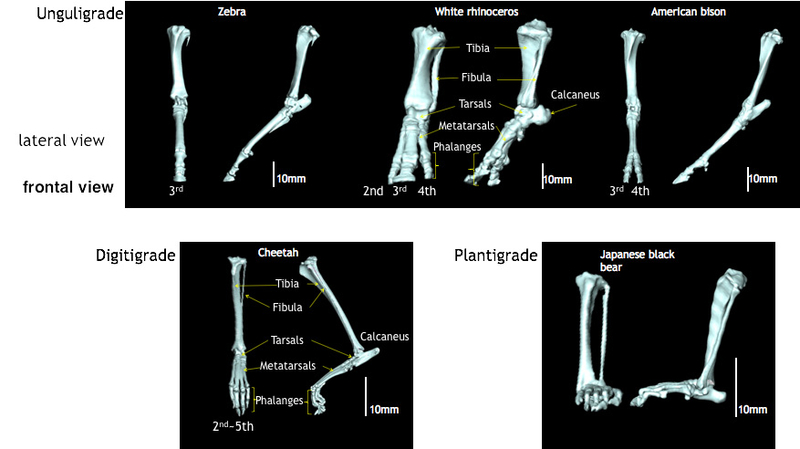 15-2 Comparative 3D CT scans of a Patas monkey and a Japanese macaque. A Patas monkey has long and straight legs. Fig. 16-2 Comparative 3D-CT scans showing the feet of unguligrade (Perissodactyla(Zebra, White rhinoceros) Artiodactyla (American bison)), digitigrade (Cheetah), plantigrade (Japanese black bear). Animals in Perissodactyla support the body weight by 3 rd digit. Fig. 17-1 The animals with long neck (animals in family of giraffe and camel) perform pace. Fig. 17-2 The sole of the camelid foot is cushioned by a fatty pad（Digital cushion).